SINGAPORE - Ms Evelyn Khoo, 41, runs a pop-up cafe with an unusual concept. It is open just one Saturday a month, at a different location each time, and charges no money - orders are paid for in free vouchers issued to customers as they enter. At Chit Chat Cafe, where volunteers serve toasted sandwiches, cake and drinks, the only "customers" are people with a condition known as aphasia. People with aphasia can have difficulty speaking and understanding speech, reading and writing, or some combination of these. It is acquired when the regions of the brain responsible for language are affected after a stroke. Ms Khoo, a speech and language therapist at the Abilities Beyond Limitations and Expectations (Able) rehabilitation centre, decided to start Chit Chat Cafe as a support network for people with aphasia when she realised there was little awareness about the condition even among those who have it and their caregivers. The cafe held its first official session on Saturday morning (Dec 22) at the NTUC Health Silver Circle Senior Care Centre in Serangoon Central with the help of 17 volunteers. The participants included 19 people with aphasia and 18 caregivers. About half the participants had attended a pilot session, held at the Able Respite Centre office in Toa Payoh last month. Participants were grouped according to their age, interests and the severity of their aphasia. One to two facilitators - professional speech therapists like Ms Khoo - joined each group at their table as the participants chatted about their lives and shared their experiences with aphasia. The conversations were relaxed and cheery as other smiling volunteers, acting as servers, flitted between tables taking orders. Many of the patients Ms Khoo has worked with were confident and outgoing before their stroke but became withdrawn after they developed aphasia. Some may also avoid going for therapy because of pride or frustration at doing therapy tasks, she said. Those who do attend therapy may be able to complete the exercises perfectly in a clinical setting but can stumble when faced with real situations. "We want them to be able to transfer what we teach them in the clinic into the real world," said Ms Khoo. Chit Chat Cafe is meant to provide a safe space for people with aphasia to practise communication and socialise in a casual and understanding environment. This could help them overcome their own psychological barriers to recovery. Ms Khoo said: "One common misconception is that people with aphasia are stupid, but that isn't the case. Their language ability may have been affected by the stroke, but their IQ and cognition are intact. "For a lot of people with aphasia, it's almost like they're in a foreign country where they don't know the language well. There's so much going on in their heads, but they just can't express it." Besides the sit-down "chit chat" session in the cafe, the volunteers facilitate games and even perform live music. The sessions also provide both people with aphasia and their caregivers an opportunity to learn more about the condition. Retired stockbroker Glen Low, 52, and retired financial analyst Wong Siew Cheong, 75, were two of the participants at the cafe on Saturday. Mr Low suffered a stroke about seven years ago. Before that, he had worked overseas extensively, spending years in countries like Australia and Russia. Through a combination of speech and writing, Mr Low said he enjoyed the musical performances and was glad to have made some new friends. Mr Wong has had aphasia for the last nine years. His wife and caretaker, Mrs Wong Lee Yong, 71, said he had been looking forward to coming for the session since he attended the pilot session last month. 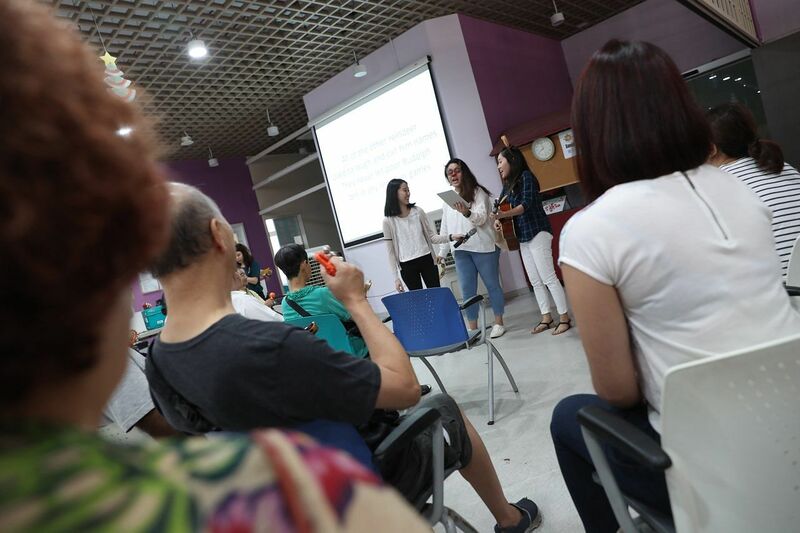 On Saturday, Ms Khoo gave a short presentation on the condition in both English and Mandarin, highlighting how those who have it can recover and improve their communication. The volunteers then sang Christmas carols to round off the two-hour session. The initiative is supported and funded by the Singapore National Stroke Association (SNSA) and venue sponsors such as NTUC Health and Able. Chit Chat Cafe sessions are currently set to run on the fourth Saturday of each month and are facilitated in English. The next session will be held in Bukit Batok on Jan 26 next year. Anyone who is interested in attending can contact the volunteers by e-mail at aphasiasg@gmail.com or join the Chit Chat Cafe Facebook group. SNSA is in the process of applying for grants for Chit Chat Cafe, with plans for expansion. 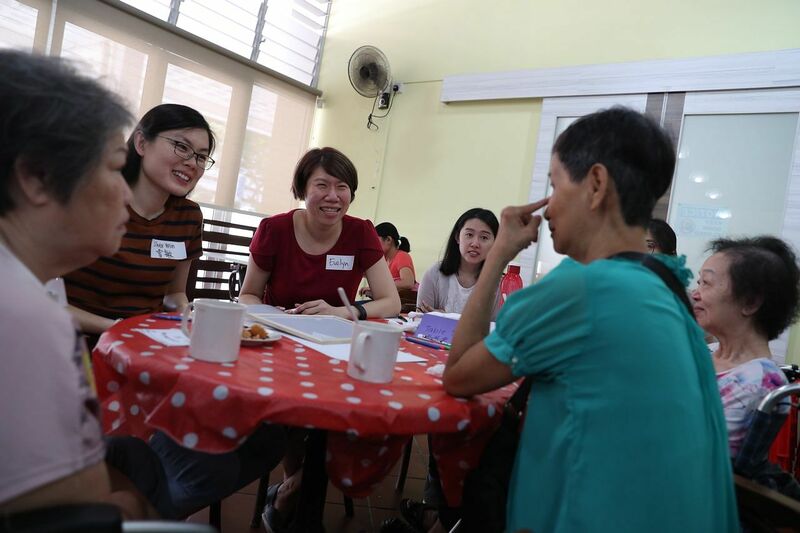 Ms Tan Poh Choo, programme manager of SNSA and a stroke survivor herself, said: "Hopefully, we'll be able to introduce a second monthly session in Mandarin with the help of more volunteers."